Note: At the 2009 IABPA meeting in Portland, OR, USA, the IABPA membership voted to adopt the SWGSTAIN recommended terminology. Several years ago, the International Association of Bloodstain Pattern Analysts (IABPA) created the Suggested IABPA Terminology List. There were 37 terms listed, but it was far from comprehensive. The IABPA also set minimum course requirements for the Basic Bloodstain Pattern Analysis Course. The second section of the course outline provides a list of patterns which should be discussed. The menu on the right combines the course requirements and the available IABPA terms from the recommended terminology list to demonstrate a means of classifying bloodstain patterns. When you select a pattern from the links at right, the IABPA definition will be at the top of the section with an example of the stain shown below. A description of the image is given below, followed by alternate terminology. The majority of the images were created in a laboratory setting with fresh human blood. For the larger volume stains, sheep blood mixed with an anti-coagulant and a preservative was used. The images are meant to serve as a general example to exhibit the characteristics of the bloodstain pattern. Given the limits of the IABPA terminology list, some bloodstain pattern analysts have created their own classification methods. 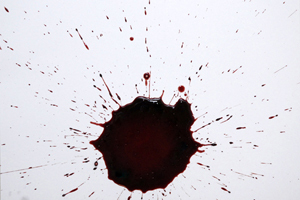 It should be noted that the Scientific Working Group for Bloodstain Pattern Analysis (SWGSTAIN) has produced a SWGSTAIN: Recommended Terminology document for the field of bloodstain pattern analysis.